Disclosure and shout-out: I’m not a mom, but I know a bunch of pretty darn great ones. Hi to my wonderful madre! During my lunch break on DC’s National Portrait Gallery steps, my fellow NWFers shared their Mother’s Day celebration plans. So what am I doing for the women closest to me this weekend? How do I put this—I sort of, well…I forgot. Thankfully our Be Out There campaign has great last-minute suggestions for fun family activities this weekend. Give mom a break and plan a fun excursion outside on May 9. Some moms don’t necessarily want more stuff this Sunday—many crave time spent with family, unplugged from the routine—and most importantly, a break from being the family organizer. Start the day by taking the Be Out There pledge to spend more time outside as a family. Then go on an outdoor adventure, from breakfast al fresco in your neighborhood, to backyard camping at night. Click here to read new mom Anne Keisman’s (@GreenHour) 5 Outdoor Adventures for Mother’s Day. 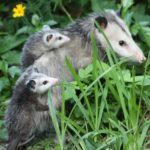 Moms – in the Wild! NWF’s work aims to inspire Americans to protect wildlife, and we celebrate mothers of all stripes including those furry and feathered. From crocodiles to kangaroos, many animal mothers go to great lengths to protect and nurture their young. Check out naturalist @Dmizejewski’s video about nature’s moms, and you can view our slide show of photos taken by members of National Wildlife Magazine’s Flickr group. Happy holiday weekend, mom or not. p.s. Love the @momsrising video Mother’s Day card—personalize the link to make your mom “Mother of the Decade” here. Photo Credit: My dad’s sneak camera attack on me and mom – Captiva, Florida.